Set on a 7.5 acre private island in Belize, this luxurious getaway features endless activities and unmatched hospitality. There are three different villas for guests to choose from, including the Big House, Hibiscus House, and the Little House. The Big House features beautiful views of the Caribbean through panoramic windows. The Hibiscus House is surrounded by lush greenery and features sweeping ocean views. The romantic Little House sits on its own secluded private beach, completely separated by water from the rest of the island. Guests have plenty of outdoor activities to enjoy, including snorkeling, scuba diving, excursions and much more. 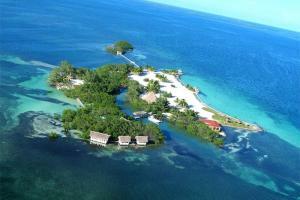 Located in Dangriga, about a 25-minute boat ride from the mainland.